Over the past 30 years, Arlyn Scales has worked hard to stay ahead of the competition. We’ve learned that constant innovation is the only way to thrive in the scale industry. Applications for industrial scales have grown immensely over the past 30 years as companies continuously look for ways to lower costs and increase efficiency. We’ve worked hard to develop a large line of floor, bench, platform, crane, drum and veterinary scales to meet the needs of our customers. Should one of our standard models not meet your needs, we’re also equipped to design custom scales for your unique requirements. At Arlyn Scales, we design and build all of our scales in our factory located in Long Island, New York, which is located alongside our corporate offices. This unique arrangement gives us significant advantages over our competitors. One primary advantage is that we’re able to ship directly to our customers, as opposed to working through a distributor network. This translates into our customers paying less for our scales. An additional advantage is that we’re able to develop scales featuring cutting edge technology, such as our Surface Acoustic Wave (SAW) technology, right here in the U.S. This allows our customers to not only get a scale at a great price, but also a scale that is on the cutting edge in terms of features and technology. By controlling the entire manufacturing and design process, we can work with your business to come up with a fully customized scale if necessary. If you’re interested in one of our standard models, but need a different sized scale platform, we can accommodate your need. Or, you may be fine with the platform dimensions, but need a different platform material. We’ll be more than happy to work with you on this request as well. The bottom line is that regardless of the features you need, we’re prepared to handle your request, if at all possible. 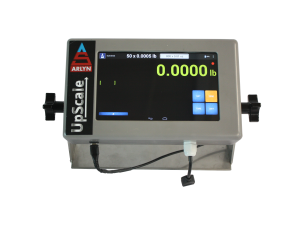 At Arlyn Scales, we’re constantly working to add new features that will benefit our wide variety of customers. The following are just some of the many options you’ll find at Arlyn Scales. Contact our knowledgeable sales team if you have questions about any of these features. In a business environment where “big data” is becoming more important with each passing day, it’s important that our scales feature computer connectivity. This allows our customers greater access and viewing options since they no longer have to be looking directly at the scale indicator for measurements. Using the following communication methods, you can access data from across the room, across the building, or even across the world. USB – The Universal Serial Bus (USB) connector is the most common method used to connect computer devices. USB ports are a given on almost every computer device built over the past several years. By connecting your scale to a PC with a USB cable, you’ll be able to control the scale using our proprietary USB Remote Software. This software will allow you to easily export weight data from the scale. Once the data has been exported, you can view it in a variety of Microsoft applications such as Excel and Access. Ethernet / WiFi – If you’re looking to control your scale remotely, we offer both Ethernet and WiFi connectivity. Simply connect your scale to your company’s Ethernet or WiFi network, where you can then use our Remote Indicator Software to communicate and control the scale from any location. This can help to greatly increase your productivity as you can quickly respond to issues that may arise, even if you’re offsite. Being able to access your scale from home or a remote location can be a lifesaver when issues arise. Datalogging – Many of our customers’ scales are located in environments that may not be conducive to a computer due to environmental conditions such as caustic chemicals. Even in these instances, our customers still need access to their weight data in some type of computer format. For these situations, we’ve added a datalogging function to our scales that allows our customers to plug a USB drive directly into the USB port of the scale and download critical weight data. After downloading the weight data, customers can access the information on a computer at their leisure. All data is stored in a CSV format, which can be accessed with a large number of popular database and spreadsheet applications. To further increase the versatility of our scales, we also offer a rechargeable battery. This internal, four-cell, rechargeable NiMH battery pack can allow you to take your scale anywhere. Once fully charged (which takes around four hours), the scale will be able to operate for more than twenty hours. Not only will this allow you to operate the scale while out in the field, but it can also help you to keep your scale online during a power outage. We also offer an optional setpoint controller that allows users to store weight values that can trigger other equipment to perform a variety of batching and filling operations. Many of our customers routinely use this functionality to automate all sorts of functions in their industrial facilities. Using this functionality, once a certain weight has been reached, mixers, motors, feeders and other machines can be turned on or off by the scale using solid state relays. By using the setpoint controller, our customers have been able to automate a variety of scale operations, and free up their personnel to focus on more detail-oriented tasks. This results in increased efficiencies that can save you time and money. Another scale option that comes standard on all of our scales is our experienced customer support. Should you have any questions about the scale options listed above, or any of our scale models, feel free to reach out to our support team by phone at 800-645-4301 or through our online contact form. The individuals that you’ll talk to are the same individuals that are designing and manufacturing your scale, ensuring that your needs are always met.